If you are interested in traveling to Bocas del Toro, Panama from San José, Costa Rica, you have a couple of options for how to make the journey. Car rentals are not an option as car rental companies do not allow cars to be taken across the border. For a fee, some offer the possibility of renting a car in Costa Rica, leaving it at the border, and picking up a different car on the Panama side. Consider how much time you have, how much you want to spend on the trip and your tolerance for discomfort before you make your decision. Obviously, making the journey by plane will be the most comfortable, but it is also the most expensive. If you choose to travel by land using public transportation, you will need to navigate buses, a taxi, a ferry and taking a short walk—not to mention you’ll be spending at least an hour navigating the intricacies of the border. If you want an intermediate option (not as expensive as a plane, but not as adventurous as a public bus), there is at least one company offering ground transportation packages. Please note: It’s best to call ahead for schedules and rates as both are subject to change. Less than an hour flight from Tobias Bolaños Airport in Pavas, San José, Bocas del Toro is an easy vacation spot when tackled by air. Nature Air (Costa Rica Tel: 2299-6000; United States or Canada Tel: 800-235-9272) is the only commercial airline offering direct flights to the island region from San José. One-way tickets range from $88 to $200. Flights leave San José at 6:30 a.m., arriving at 8 a.m. (Panama time). 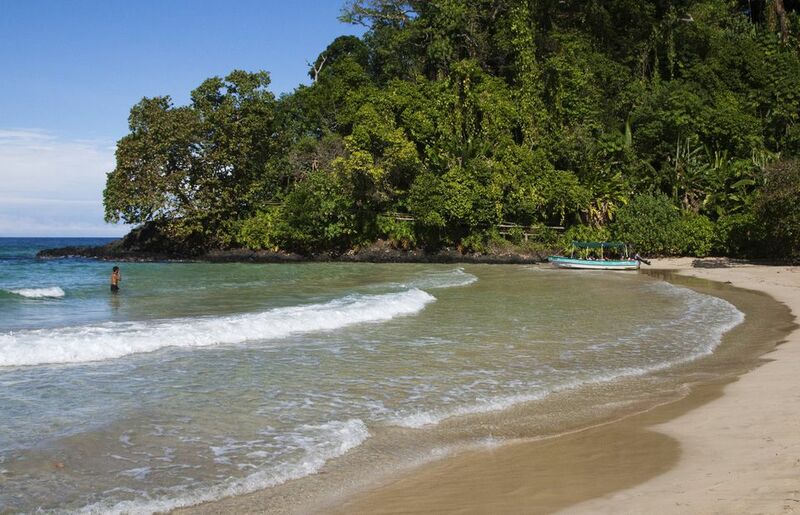 The return trip leaves Bocas del Toro at 9 a.m., arriving in San José at 9 a.m. (Costa Rican time). The plane arrives at the main Colon Island in Bocas del Toro and most hotels are a short walk or a $1 taxi ride, away. There are private tour companies offering non-stop ground transportation between San José and Bocas del Toro; one of which is Costa Rica Just For You (Costa Rica Tel: 2273-8000; United States or Canada Tel: 866-598-3956), which charges ~$51 to take tourists from San José to Bocas in an air-conditioned shuttle. The shuttle leaves from San José and will pick you up from your hotel. Mepe (Costa Rica Tel: 2257-8129 or 2758-1572): From the Caribe station, take the bus heading to Sixaola at 6 a.m. This bus takes six hours and stops in Cahuita and Puerto Viejo. The fare is around $11. If you take any later buses, you risk not making all the required connections and might find yourself in an undesirable place to stay the night. Transportes Bocatoreños (Panama Tel: 2758-8511; Costa Rica Tel: 2227-9523 or 2259-1325): The station for Bocatoreños is just north of the Coca Cola Bus Terminal in downtown San José in front of the Hotel Cocori. Once at the border, you’ll have to get an exit stamp from Costa Rica and an entrance stamp from Panama. If you don’t already have a ticket showing that you are leaving Panama in six months, you must purchase one on a roadside shack down the stairs and to your immediate right once you cross the bridge. If you look lost, there are plenty of people who speak English milling about the border and will usually point you in the right direction. There is also a ~$3 visa fee on the Panama side. At the Panama side of the border, look for the vans lined up at the foot of the stairs. For $10, these will take you the hour-long trip to Almirante, where you catch the ferry to Bocas del Toro. There’s also the option of taking a local bus for around a $1, but this is a sweatier, more complicated alternative with no guarantee of getting you to the ferry before service shuts down for the evening. There are two ferries in Almirante to take you the rest of the way to Bocas del Toro. Each has boats leaving every half hour (or whenever they fill up) and costs between $4 and $5. On the return trip, be sure to leave Bocas del Toro before 1 p.m. You’ll need at least an hour and a half to make it to the border and enough time to process the paperwork in order to catch the last bus to San José at 3 p.m. The bus from Changuinola, Panama to San José leaves at 10 a.m. from the terminal in Changuinola. To catch one of the Mepe buses from Sixaola, descend the stairs to your right after you cross the border and walk one block into the town of Sixaola.